Snow ploughs only work effectively when snow is more than 5cm (2inches) deep. If snow fall reaches this level, Grounds Maintenance will use a combination of snow ploughs and other methods to clear the snow as snow ploughs cannot go over road humps or similar traffic calming measures. Grit does not melt snow and therefore grit cannot be applied on top of deep snow. Refer to understanding gritting for more information on how gritting works. 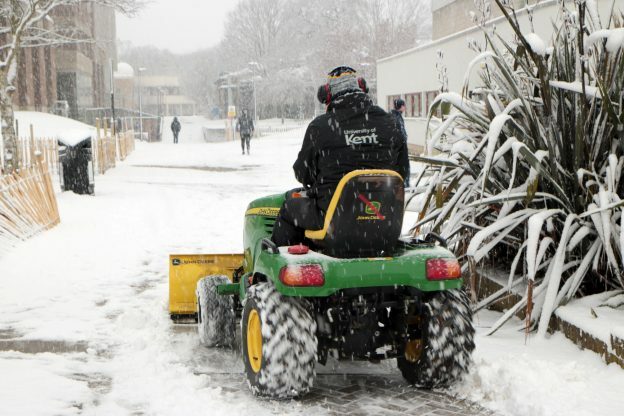 Similar to how local authorities manage snow clearance, the Estates department will aim to clear all University of Kent roads and main footpaths before starting on other areas across the campuses. Please refer to the University’s Snow and Ice Policy for more information. This entry was posted in News and tagged ice, snow, snow clearing on January 28, 2019 by Miriam Sandiford.